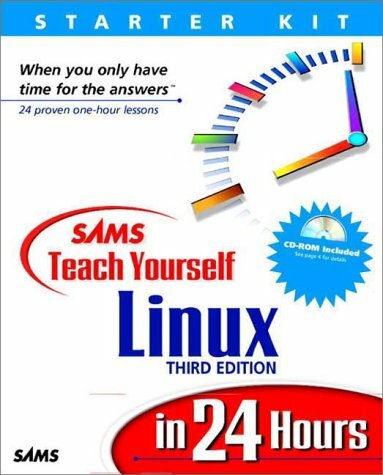 In just 24 lessons of one hour or less, you will be up and running with Linux. Using a straightforward, step-by-step approach, each lesson builds upon the previous one, allowing you to learn the essentials of Linux from the ground up. Learn how to: Install Linux quickly and easily; Make Linux work for you; Optimize and personalize your system; Identify the differences between Linux distribution and choose one that is right for you; Connect to the Internet and configure your system to distribute mail and news messages; Write and modify your own configuration files; Troubleshoot problems and maintain your system; Put Linux applications to work. Bill Ball is a technical writer, editor, and magazine journalist, and has been working with computers for the past 20 years. He first started working with Linux, starting with kernel version .99, after moving from BSD4.3 Machten for the Apple Macintosh. He has also published Linux PPP network connection guides for local Internet Service Providers in northern Virginia. He has taught desktop publishing, served as an Apple Federal Support Coordinator, and was once a bulletin board system operator. He has published more than a dozen articles in magazines such as Computer Shopper and MacTech Magazine, and first started editing books for Que in 1986.